2012 is the biggest mystery of our time. Some people feel 12/21/2012 is just going to be another day and all of these theory's of what 's going to happen is just non-sense. Others feel it's spells doomsday and it's end of the world for all of us. Well, I have my own theory mostly all based off hard science and hard facts. 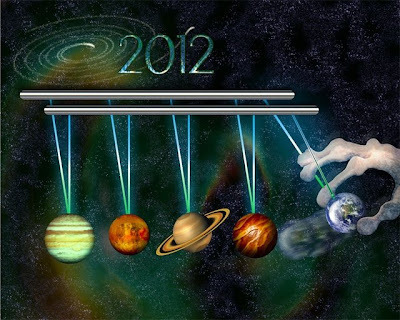 I have come to the conclusions that 12/21/2012 is a marker of time that will have great significance on the entire world. After you see the facts I have laid out there is no denying the significance of the most famous date in history. Let's talk about water for a moment. For those who haven't heard about the mysteries of water. Scientists have discovered that water has a consciousness to it. A Dr. Masaru Emoto did an experiment where he would flash freeze water while either playing different kinds of music, or actually just talking to it. He found that the water would react different to each song and each word that was spoken. The more negative the music or words being spoken, the more distorted the patterns were. The more positive it was, the more perfectly structured the ice crystals became. Something even more amazing, an experiment that was done with a pitcher of water from the documentary "Water the Great Mystery". The water was separated into two separate pitchers and were separated at a great distance. They found when one pitcher of water was exposed to information, the other that was separated restructured itself instantly, to respond with that information. 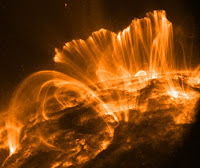 Now to one step beyond that, their was a Russian scientist named Alexander Chizhevsky, who noticed that when the sun had solar flares, bacteria in water would have an instant reaction, not light years later, but at the exact moment. He also confirmed changes in human behavior due to solar flares. Now lets remember for a moment that that water consists of two hydrogen atoms bonded too a single oxygen atom, and that hydrogen is of-course the most ab undant substance in the universe. We as humans are made up of 55 to 85% water, which makes us more than half water. We all know that the sun created life, and know it changes it as well. In the scientific studies with water, it's been proved that the molecular structure can be aligned with different frequencies. Everything in the universe emits frequencies in one way or the other, but it's the Sun's frequencies that have the most effect on the Earth and our solar system. So now take in the fact that a large majority of what were made up of is hydrogen and the sun effects hydrogen atoms at the exact moment the sun decides to flare. This has lead other studies that revile historic times of war tend to correlate with sunspot cycle's on the sun, meaning that the sun cycles directly effect human psychoses. Two very interesting facts about earth. Fact one: our magnetic field has been decreasing for the last 2000 years, and the rate with in the last 500 years has spiked immensely and with in the last 20 ye ars it has become so erratic that the aeronautical maps (what autopilots on planes are guided by) have had to be reconfigured around the world in order for the autopilot systems to work. Fact two: 2007 was the first year where the Arctic cap melted in the precise concordance of the North Pole and it's the first time in history that it hasn't been at least ten feet thick. 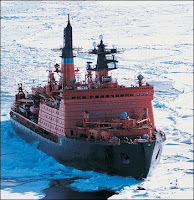 Civilian and military ships both floated over the north pole in late 2007. The Danish put out a recent study that was published in January 2009 showed a strong corr elation between the strength of the Earth's magnetic field and precipitation in the tropics, leading them to believe that our planet's weather is being affected by galactic cosmic ray particles or GCR's penetrating Earth's atmosphere. Something ell's they found was that the Earth's magnetic field has recently had some radical changes. 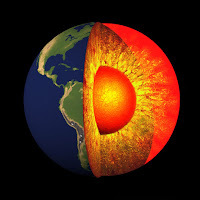 Co-author Nils Olsen, a geophysicis t at the Danish National Space Center in Copenhagen said "What is so surprising is that rapid, almost sudden, changes take place in the Earth's magnetic field," and their findings suggest quick changes are simultaneously occurring in the liquid metal 1,900 miles below the Earth's surface. 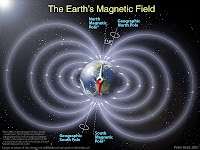 They have also found many fluctuations in the magnetic field occurring on several points around the planet leading them to believe the possibility of an up coming reversal of the magnetic poles. The Earth has reversed it's poles hundreds of times over the last billion years and it's been about 750,00 sense the last time it's happened making us well over due. This process could take thousands of years to complete. Another dicovery that was made recently is that an unidentified source of high-en ergy cosmic rays are bombarding Earth from somewhere nearby our solar system. John Wefel of Louisiana State University and Principal Investigator for ATIC (Advanced Thin Ionization Calorimeter, a NASA funded balloon-borne instrument high over Antarctica) states "This is a big discovery, It's the first time we've seen a discrete source of accelerated cosmic rays standing out from the general galactic background. 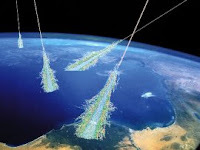 This electron excess cannot be explained by the standard model of cosmic ray origin, there must be another source relatively near us that is producing these additional particles." The results show an unexpected surplus of cosmic ray electrons reaching 300-800 billion electron volts. They have come to the conclusion that the source would indeed need to be within 3,000 light years of the sun and is most likely to be some like of pulsar, mini-quasar, supernova remnant or an intermediate mass black hole. "Cosmic ray electrons lose energy during their journey through the galaxy," said Jim Adams, ATIC research lead at NASA's Marshall Space Flight Center in Huntsville, Ala. "These losses increase with the energy of the electrons. At the energies measured by our instrument, these energy losses suppress the flow of particles from distant sources, which helps nearby sources stand out." An article published a week later relieved where the source may be coming from. A Los Alamos National Laboratory cosmic-ray observatory has seen for the first time mapped two distinct hot spots that appear to originate near the constellation of Orion. FYI, that's the same area that it's said planet X originates from. 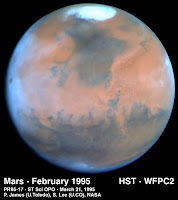 Launched in February 2007 was NASA's Time History of Events and Macroscale Interactions during Substorms mission named THEMIS. Consisting of five probes to record and determine what physical process in near-Earth space initiates the violent eruptions of the aurora that occur during substorms in the Earth's magnetosphere. June 3, 2007 is when the first big discovery was made. It's necessary to understand that we are protected by the Earth's magnetosphere and it's what stops solar winds from wreaking havoc on our planet. Scientist were very surprised to find out that there had been a breach in the Earth's magnetosphere just as the probes were enter that space. Sensors recorded a torrent of solar wind particles streaming into the magnetosphere creating an event of extraordinary size and importance. But that's not what was so stunning. THEMIS project scientist David Sibeck states "At first I didn't believe it, this finding fundamentally alters our understanding of the solar wind-magnetosphere interaction." Wenhui Li, University of New Hampshire's space physicist who has been analyzing the data says "The opening was huge—four times wider than Earth itself,". Scientist never thought the breach would be on this kind of scale and is completely changing their understanding of the universe itself. Li's colleague Jimmy Raeder, says "We've seen things like this before but never on such a large scale. The entire day-side of the magnetosphere was open to the solar wind." What this means is that solar wind presses against the Earth magnetosphere for the most part directly above the equator where our magnetic field points north. 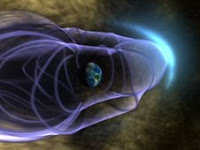 When before it was the understanding that if a bundle of solar magnetism came along and as well points north, the two fields would reinforce each other strengthening Earth's magnetic defenses while slamming the door shut to the solar winds. When the solar magnetic field points north it's called "northern IMF" this would be considered on earth "shields up". What was so surprising is when the northern IMF came along our shields went down, which left many scientist confused and questioning their understanding of how things worked in the universe. This discovery relieved that twenty times more solar wind passed in to the Earth's protective shield when the magnetic fields were aliened, which sets the stage for loading the magnetosphere with plasma and will in turn create auroras and power outages on a global scale. 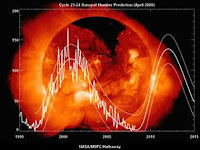 Raeder also states, "We're entering Solar Cycle 24. For reasons not fully understood, CMEs in even-numbered solar cycles (like 24) tend to hit Earth with a leading edge that is magnetized north. Such a CME (coronal mass ejection) should open a breach and load the magnetosphere with plasma just before the storm gets underway. It's the perfect sequence for a really big event." 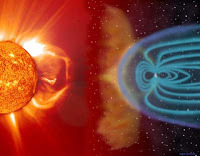 The Earth's and Sun's magnetic fields will be in sync at the solar cycle's peek which is scheduled to happen in latter part of 2012. Now time to talk about the latest events of our Sun. The Sun flips it's magnetic poles about every 10 to 11 years which is also known as sunspot cycle's. We are now coming to the end of cycle 23 which happened to produce some of the greatest sunspot activaty ever recorded and now getting ready to enter the cycle 24. Scientist are very confident about this forecast because of the simulated models made in the past that have had a 98% accuracy rate. Now in any given forecast you can have anywhere from 75 to 155 sunspots. The more sunspots there are, the more violent solar winds are produced and the more damage it can have on our electronic grid, effecting GPS systems, communications, and causing blackouts. Some scientist say there will only be a minimal number of spots peaking late 2011 and others say the sunspot numbers will be high peaking late 2012. 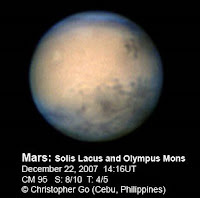 NASA predicts the peak to happen in may 2013 with a below average number of spots somewhere around 70. 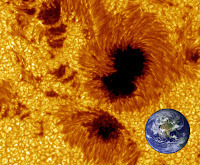 Panel chairman Doug Biesecker of the NOAA Space Weather Prediction Center says "Even a below-average cycle is capable of producing severe space weather, the great geomagnetic storm of 1859, for instance, occurred during a solar cycle of about the same size we’re predicting for 2013." The storm of 1859 was known as the "Carrington Event" after astronomer Richard Carrington who witnessed this solar flare that electrified transmission cables, set fires in telegraph offices, and produced northern lights so bright that you could read a news paper by the red and green glow. The national Academy of Sciences reported recently if a similar storm happened today, it would cause anywhere from $1 to 2 trillion dollars in damages to our high-tech infrastructure and would require four to ten years to recover. 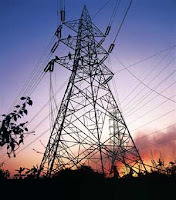 Even the relatively weak magnetic storm of 1989, caused the power outage of a Canadian hydro-electric power plant that left 6 million people in the U.S. and Canada without power for nine hours. "It turns out that none of our models were totally correct," says Dean Pesnell of the Goddard Space Flight Center, NASA's lead representative on the panel. "The sun is behaving in an unexpected and very interesting way." It turns out that these cycles can last any were from 9 to 14 years says NASA. In the 17th century the sun plunged into a 70-year period of spotlessness know as the Maunder Minimum which completely baffles today's scientists. Right now in 2008 and 2009 have set a space age record for the least amount of sunspots ever seen in one's career. The sun has now gone more than two years without a significant solar flare and it's foretasted to stay calm until September of 2010. But as you can see forecast don't mean a whole lot right now. Although according to a breakthrough forecast using a computer model of solar dynamics developed by scientists at the National Center for Atmospheric Research (NCAR), they predict this next sunspot cycle will be 30-50% stronger than the last one and begin as much as a year late. This team seems to be the most accurate anyway, their track record has been 98% correct for the last 8 cycles. A quick note about the sun's gravity, a recent study done by Dr. Mike Lockwood from Rutherford Appleton National Laboratories in California proved that the suns magnetic field has changed significantly. He reports that sense 1901 the sun's magnetic field has increased by 240% keeping scientist scratching their heads. Dr Nathan Schwadron, co-investigator on the IBEX mission at Boston University, said: "The interstellar medium, which is part of the galaxy as a whole, is actually quite a harsh environment. There is a very high energy galactic radiation that is dangerous to living things. Around 90 per cent of the galactic cosmic radiation is deflected by our heliosphere, so the boundary protects us from this harsh galactic environment." 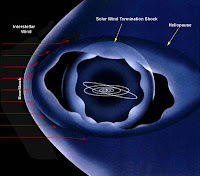 Without the heliosphere the harmful intergalactic cosmic radiation would make life on Earth almost impossible by destroying DNA and making the climate uninhabitable. compound referred to as ''Natrium.'' there is now a 6,000-kilometer-deep layer of Natrium that wasn't there before. Jupiter's magnetic field has more than doubled. Uranus's magnetic field is noticeably changing while Neptune's magnetic field is increasing. These planets are becoming brighter and their magnetic field strength is getting stronger. Their atmospheres are changing just like ours. 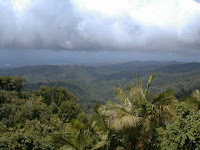 Overall volcanic and earthquake activity along with natural disasters has increased 500 percent since 1970 On the Earth. The glowing plasma at the leading edge of our Solar System has recently increased 1000 percent and this means that the Solar System itself is moving into an area where the energy is more highly charged which causes the solar emissions to travel more quickly and charge up the energy on the planets. This is conscious energy that is changing how the planet works, how it functions, and what kind of life it supports. The harmonics of the DNA spiral itself are altering. That's the real, hidden cause of spontaneous mass evolutions in previous epochs of time. What this all means is we will soon get to the point where we are so far into a new level of energy that there will be a sudden expansion of the basic harmonic wave lengths that the sun emits as it radiates energy outward. This increase in energy emission will change the basic nature of all matter in the solar system. Knowing that there is an instant reaction among hydrogen and the sun, everything could change and react with in an instant. 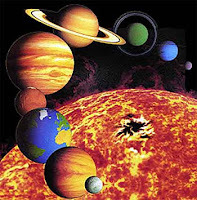 The planets will be push slightly farther away from the sun, and the atoms and molecules that make up everything in our solar system will physically expand in size. Changing the makeup of everything as we know it. Changing our DNA as we become an enlightened human race and there will be no choice in the matter, for we are at the mercy of everything that surrounds the earth. We have no control of space and time, it controls us. Soon we will welcome the dawn of a new "Golden age", or as some call it the "Age of light". 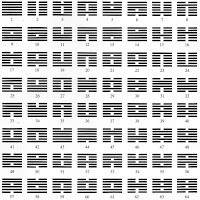 Everything we know from the Mayan calender and the I Ching tells that their calenders go back to point zero. For many enlightened beings this means a dramatic evolution of human kind into a higher plane of consciousness, and when you do the math and look at the science of everything, it really starts to make sense of whats really going to happen. In a way were still left in the dark because scientist seem to keep discovering new things about our sun and our solar system everyday. It's all a matter of interfaith and that inner feeling you may have about what is going to take place. No matter how you look at the science or predictions of the the ancient scriptures, things are changing, and these changes are by no means small or insignificant. By adding the pieces together that correlate to the date of December 12, 2012, for me it all starts to make sense. Just take a look at how many new documentaries the History channel as made on 2012, what the profits say and the scientific facts. You have to let go of what you think you know, look at the evidence of what is really happening scientifically and physically to our solar system, our sun, our planet and our selves. 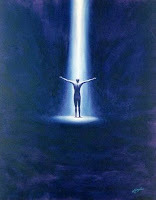 Open your mind to what could be and attain the knowledge that may help you get through the large changes that are coming in 2012, because their coming like it or not. 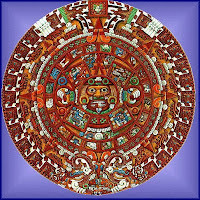 What exactly they are we can only theorize, and that is this knowledge you need to attain for your attainable mind in 2012.